For the last few years, my husband and I have participated in a farm share program with some of our friends. If you’re not familiar with what a farm share is, it means that you purchase an animal from a farmer and split the meat. All parts of the animal are used (yes, I had kidneys in my freezer for a long time), it provides quite a lot of meat for a reasonable price, but most of all it ensures that you’re getting quality meat from a traceable source. We like to eat grass-fed or organic meat. The issue with this system though, is that you have to take all the meat up front (an entire animal, butchered and vacuum sealed) and someone has to pick it up from the farm which is generally far from the city. It was while I dragged 40 lbs of rapidly thawing lamb up to my condo one evening that I started to feel like this arrangement could be greatly improved. Apparently, I wasn’t the only one. Two Canadians dreamed up the idea for truLocal, for people like myself who want quality meat from a local farm. Just choose the size of box you want, and fill it with your choice of meats and fish from local sources. The box is delivered to you and packed with dry ice so it stays nice and frozen until you come home to retrieve it. I found the variety of meats very plentiful, and it changes by province. Currently, truLocal is available in Ontario, Alberta, and BC. On top of the convenience of this program, the meat and fish I received have an incredible taste and texture. Quality of protein is a priority for me over quantity, every time. This is what I got in my box! I decided to use the wild caught sockeye salmon for a tasty, bright, and fresh lunch recipe. Scroll down for the full recipe! Free from: peanuts, nuts, dairy, soy, egg, shellfish. *does not apply to the toast. Always read the label before purchase and use a brand of bread that is safe for you, or bake your own. Prepare the salad first, allowing it time to marinate while you work on the rest of the meal. Add the cucumber, pear, fennel, and oranges to a mixing bowl. Pour half of the lemon juice on top, as well as half of the olive oil. Toss well and season with salt to taste. Set aside. Next, prepare the salmon. Preheat the oven to 375F and line a baking sheet with parchment paper. Pat the salmon dry with paper towel, and season well with sea salt. Heat about 2 tsp of olive oil in a non-stick pan. Give the fillets a good sear (they should be sizzling) for about 5 minutes to crisp up the skin. Transfer the fillets to the baking sheet and bake for 7 - 9 minutes. Finally, make the dressing. Add the remaining lemon juice and olive oil, dill, chives, and garlic to a small bowl. Mix well and season with salt to taste. To assemble, spread the arugula out on two plates. 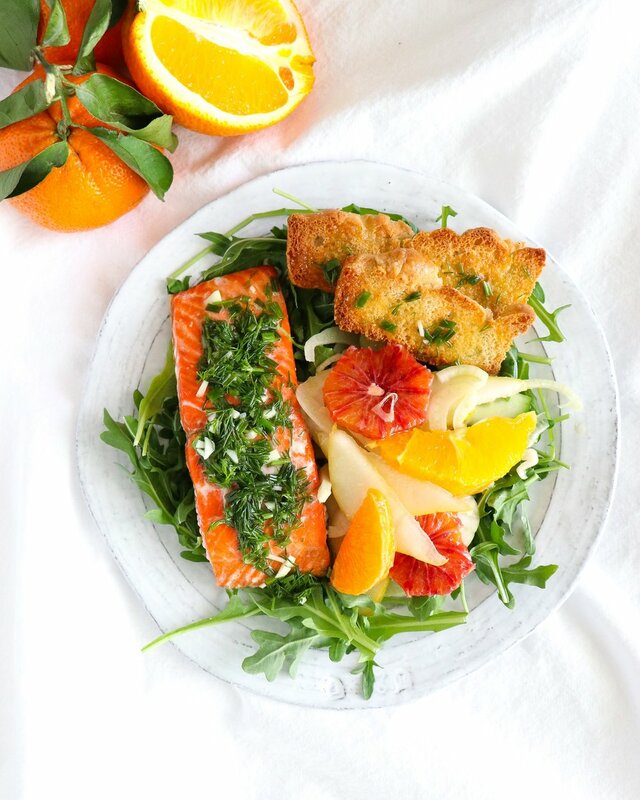 Scoop a big serving of salad onto each plate, plus a fillet of salmon, and a piece of toast. Spoon the dressing generously onto the salmon and toast.